This area of mathematics is about the assignment of geometric structures to topological spaces, so that they "look like" geometric spaces. For instance, compact two dimensional surfaces can have a local geometry based on the sphere (the sphere itself, and the projective plane), based on the Euclidean plane (the torus and the Klein bottle), or based on the hyperbolic plane (all other surfaces). Similar questions in three dimensions have more complicated answers; Thurston showed that there are eight possible geometries, and conjectured that all 3-manifolds can be split into pieces having these geometries. Computer solution of these questions by programs like SnapPea has proved very useful in the study of knot theory and other topological problems. Are most manifolds hyperbolic? From Dave Rusin's known math pages. Bending a soccer ball mathematically. Michael Trott animates morphs between a torus and a double-covered sphere, to illustrate their topological equivalence, together with several related animations. Boy's surface: Wikipedia, MathWorld, Geometry Center, and an asymmetric animated gif from the Harvard zoo. Double bubbles. Joel Hass investigates shapes formed by soap films enclosing two separate regions of space. Figure eight knot / horoball diagram. Research of A. Edmonds into the symmetries of knots, relating them to something that looks like a packing of spheres. The MSRI Computing Group uses another horoball diagram as their logo. The flat torus in the three-sphere. Thomas Banchoff animates the Hopf fibration. Gallery of interactive on-line geometry. The Geometry Center's collection includes programs for generating Penrose tilings, making periodic drawings a la Escher in the Euclidean and hyperbolic planes, playing pinball in negatively curved spaces, viewing 3d objects, exploring the space of angle geometries, and visualizing Riemann surfaces. Geometric probability question. What is the probability that the shortest paths between three random points on a projective plane form a contractible loop? Hilbert's 3rd Problem and Dehn Invariants. How to tell whether two polyhedra can be dissected into each other. See also Walter Neumann's paper connecting these ideas with problems of classifying manifolds. Hopf fibration. R. Kreminski, the U. Sheffield maths dept., and MathWorld explain and animate the partition of a 3-sphere into circles. Laying Track. The combinatorics and topology of Brio train layouts. From Ivars Peterson's MathTrek. 3-Manifolds from regular solids. Brent Everitt lists the finite volume orientable hyperbolic and spherical 3-manifolds obtained by identifying the faces of regular solids. Mathematically correct breakfast. George Hart describes how to cut a single bagel into two linked Möbius strips. As a bonus, you get more surface area for your cream cheese than a standard sliced bagel. Mathenautics. Visualization of 3-manifold geometry at the Univ. of Illinois. Möbius at the Shopping Mall. Topological sculpture as public seating. From MathTrek. 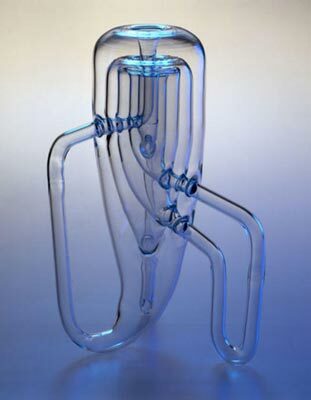 Nested Klein bottles. From the London Science Museum gallery, by way of Boing Boing. Topological glassware by Alan Bennett. The Optiverse. An amazing 6-minute video on how to turn spheres inside out. The Pretzel Page. 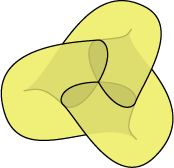 Eric Sedgwick uses animated movies of twisting pretzel knots to visualize a theorem about Heegard splittings (ways of dividing a complex topological space into two simple pieces). Pseudospherical surfaces. These surfaces are equally "saddle-shaped" at each point. Riemann Surfaces and the Geometrization of 3-Manifolds, C. McMullen, Bull. AMS 27 (1992). This expository (but very technical) article outlines Thurston's technique for finding geometric structures in 3-dimensional topology. SnapPea, powerful software for computing geometric properties of knot complements and other 3-manifolds. Morwen Thistlethwait, sphere packing, computational topology, symmetric knots, and giant ray-traced floating letters. The Thurston Project: experimental differential geometry, uniformization and quantum field theory. Steve Braham hopes to prove Thurston's uniformization conjecture by computing flows that iron the wrinkles out of manifolds. Tiling dynamical systems. Chris Hillman describes his research on topological spaces in which each point represents a tiling. Lun-Yi Tsai paints fine art of foliatied 3-manifolds, differentiable atlases, and other topological structures. UMass Gang library of knots, surfaces, surface deformation movies, and minimal surface meshing software. Matthias Weber's gallery of ray-traced mathematical objects, such as minimal surfaces floating in ponds.